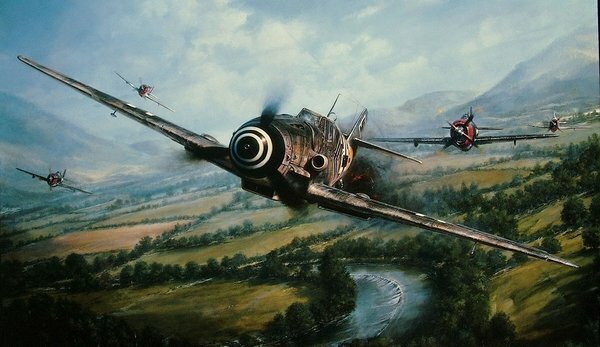 "THE WARRIOR AND THE WOLFPACK"
On May 12, 1944 during homeland defense operations, Major Guenther Rall, commanding Me109s from JG11, effectively attacked a group of U.S. P-47 Thunderbolts of the 56th Fighter Group, nearly downing its famed leader, “Hub” Zemke. Shortly thereafter, Rall found himself trapped in a formation of “Jugs”, employing for the first time an aerial strategy developed by their brilliant group leader, known as the “Zemke Fan”. Outnumbered and outgunned by four Wolfpack P-47s, it was only by his extraordinary skill and experience did Rall manage to escape disaster, losing his left thumb in the process. By the war’s end, Guenther Rall had achieved a remarkable 275 air victories, making him the 3rd-highest scoring ace in history. After the war, this legendary pilot would not only become close friends with Zemke and many of his pilots, but he would also come to consider the U.S. his second home, even playing a large role in the U.S. Air Force’s F-104 program.